Just when a downtown tourist attraction was fast becoming an eyesore, the Old Market Business Association made its move. The Mercer Building, gutted by a devastating January fire at its corner of 11th and Howard Streets, has drawn thousands of locals and tourists alike to witness its awful allure and unsteady reclamation. But with Berkshire-Hathaway weekend and Farmers Market on the horizon and the Spring rebirth of foot traffic once again in full bloom, the OMBA began a process to reframe this iconic cornerstone of activity and commerce in Omaha. 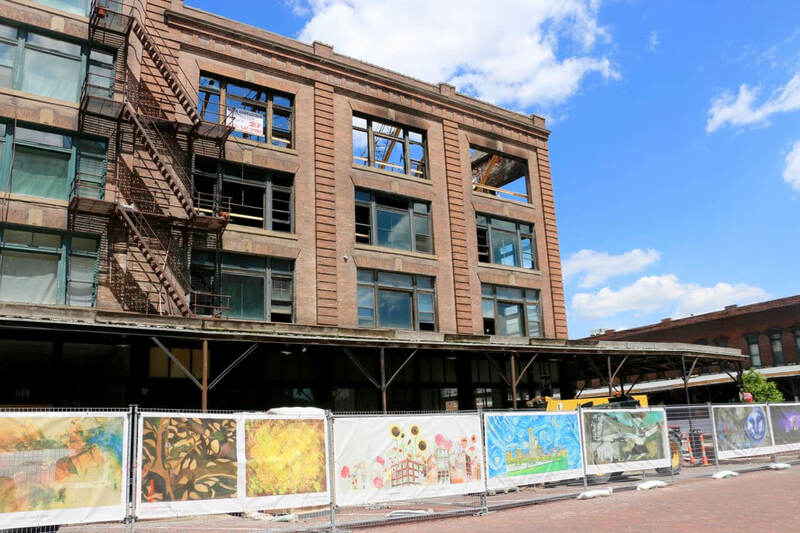 The result is the generically titled Old Market Art Project, which features digital prints from 37 area artists placed on banners and fastened to the chain-linked fence that surrounds the Mercer Building renovation. Given its low-key approach and little fanfare, first impressions from the arts community and viewers have been quite good. Nearly 300 artists responded to OMBA’ invite to participate, sponsorships helped finance the banners produced by Curzon Promotional Graphics and visitors are again taking selfies along the fence. Only this time the charred remains in the background are filtered and framed by something more than dust and cranes. Project committee member Steve Raglin credits OMBA President Troy Davis with the original idea of using a site-specific, public art initiative to help offset reconstruction and anticipated traffic congestion. Judges included Vera and Mark Mercer, Jo Anderson, Roger DuRand, Steve Joy and Kathy Nevins, all who have ties to the Old Market. So do many, if not all, of the artists who received a $100 stipend and a credit along with their sponsor on each banner. A complete list of the artists and their sponsors can be found at oldmarket.com/artproject. Though artist compensation is quite small, participants, understandably, rallied to the call for reasons other than monetary, a mix of both the personal and professional. Personal reasons aside, all three see the project’s potential for professional growth, both individually and collectively in the arts community. It’s the sort of investment Elliott-Bartle says could have long-term benefits after the banner display comes down about a year from now according to the OMBA. Though Raglin accurately points out that the range of artwork includes “unpublished artists who have never had a gallery exhibition” viewers will recognize as well as enjoy prints from many more established names including Steve Joy, Erin Blayney, Joseph Broghammer, Karen Kunc, Kat Moser, Christina Narwicz, Rebecca Hermann, David Hernandez, Bill Hoover, Bart Vargas and Judith Welk among others. You can’t miss Pluhacek’s red sunflower pastel surrounded by green eucalyptus and other pods and a globe rising portentously in the air. Her print dominates one’s view facing north at the corner and sets a tone for this public art spectacle. Elliot-Bartle’s mixed media piece “Prairie Road,” the original an oil on birch panel, depicts a path collaged from handmade Tibetan paper cutting though a grassland. The subject has a portent of its own for the artist. “The Way It Feels Sometime,” in Wallace’s signature storybook style that appeals to all ages, also reflects the pervasive Old Market mood and resolve since the fire. In this narrative, a detail based upon an earlier series, the childlike Corky suddenly stumbles, falls flat, but then is soon is on the move again. Other established artists in this display, such as Hoover, Broghammer, Joy, Kunc, and Vargas also rely on their aesthetic, a few with a variation or comment. For example, Broghammer abandon’s his “flock of Joe” iconic aviary, and offers a carefully crafted sow’s head, Vargas uses his geometric montage like a landing strip to the reno’s epicenter. And, Hoover, better known perhaps for his lighter, narrative touch, depicts a rather ominous, darker abstract of a child running on a playground. Several artists rely heavily on representational Old Market and downtown scenarios including Alyssa Busse’s pastiche, Andy Boonstra’s stormy night skyline, and David Hernandez’s Van Gogh’s “Starry Night” inspired skyscape. More to the point, however, are the homages to Nouvelle Eve and M’s Pub by Lisa Gill and Julia Mason. Most poignant of these is the restorative winter scene of 11th and Howard by Judith Welk in her own traditional folk art style. But a personal favorite is Garry Allen’s simple, but elegant contour drawing of two figures paradoxically toasting a time well-spent and more soon to come. Four artists in particular, Joy and Blayney, Hermann and Kunc, take a more abstract approach in tandem and in complementary fashion to the January tragedy. Joy’s subdued, geometric mix sharply mimics the jumbled bric a brac that lies beyond the fence in the aftermath while Blayney’s more expressionistic cool and hot palette mimics the nightmare night of fire, smoke and ice that came before. Hermann and Kunc’s abstractions enjoy a similar relationship to the evolving scenario above and beyond the banners. Yet, now each pattern indicates that reconstruction has begun, piece by piece, Hermann in her hard-edged, bold design and Kunc in a flowing pastel. Slowly, artfully, the whole becomes greater than the sum of its parts. A year from now, the banners will come down, a bit worse for wear perhaps, but possibly with yet another undetermined life to live. Raglin said they may be auctioned off to also benefit other OMBA projects, “but that has yet to be decided.” The artists also have mixed feelings as to their use. Wallace is also unclear of the banner’s future but not of ownership. Whatever else happens to the artwork, Pluhacek likely speaks for all the participating artists with regard to the big picture.